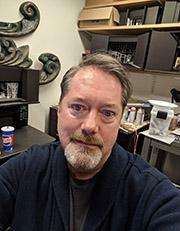 Mark Halpin, a frequent guest designer before becoming a permanent member of CCM's faculty, has designed over 40 shows for CCM. Some favorite designs include The Wild Party, Chess, The Time of Your Life and Noises Off. Halpin has also designed scenery for Williamstown Theater Festival, Cincinnati Playhouse in the Park, ETC, The Human Race, Stages St. Louis, Casa Mañana, Theater by the Sea, Honolulu Theater for Youth and others. Halpin has created scenery for numerous theme parks, zoos, cruise ships and corporate clients, including Universal Studios - Florida, LegoLand Windsor, Radisson and Princess Cruise Lines, Steven Spielberg's The Dive restaurant, and many others. Fond of exploring far-ranging creative pursuits, Halpin has created word puzzles appearing in The New York Times and on NPR's Ask Me Another, and his original musical The Kid in the Dark was named Cincinnati's Best Alternative Production in 2007. BFA , Northern Kentucky University, Highland Heights, KY.
MFA, University of North Carolina at Greensboro, Greensboro, NC.